Discussion in 'Hunting, Fishing & Camping' started by GOYABEAN, Feb 13, 2019. DEC reminds anglers that February 16-17, 2019 is a free fishing weekend in New York. During this period, anyone can fish without the requirement to obtain a New York State fishing license. If you have never tried ice fishing, there is no better time to give it a try. Better yet, bring family and friends and make it a fun outdoor weekend. Visit DEC's website for more information on ice fishing in New York. 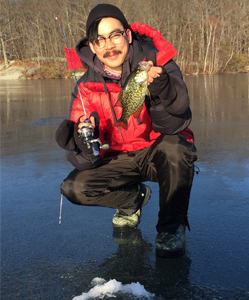 Download the I FISH NY Guide to Ice Fishing (PDF). I'll be thinking of you while I sit by the fireplace sipping scotch. Deplorable Me and GOYABEAN like this. Deplorable Me, MoMan, GOYABEAN and 1 other person like this. 1. Where did they get that guy's picture. 2. If anything is free in NY you'd better take advantage of it. I don't fish much, especially in February, but I'll stand there with my pole in the water and my pud in my hand just because its "free" in NY. GOYABEAN and Saltwater60 like this. "Free" fishing weekend, in NYS, in February!!!! kev74 and GOYABEAN like this. A lot of trouble for a crappie fish. BDinPutnam and GOYABEAN like this. what if there is no ice here locally ?? can i still free fish ? If you have never tried ice fishing, there is no better time to give it a try. Better yet, bring family and friends and make it a fun outdoor weekend. I thoughts democrats wanted to ban ICE in NY? GOYABEAN and Acer-m14 like this. If you want to fish in February jump on a party boat in Montauk for some cod. Ice fishing....invented by a man with a very ugly wife. Yea, I know, I used to do it when I lived up there.